Second one I've purchased (baby tipped the first one and water went down in the fan and killed it. Lesson learned.) 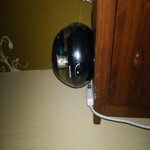 it works like an essential oil diffuser-- small vibrating plate causes "fog" which is blown by a fan out a chute at the top. Every surface can be cleaned; no hiding spots for mold, no nasty filter to replace. It does put out a lot of moisture so don't set it near or on anything that cannot get damp ( wood, leather, etc) in all, a fantastic little machine. We bought one last year for our room and liked it so much we bought a 2nd for our kids room. Its quite and comes in different colors. Large tub to hold water so it last for a long time. Also has adjustable setting so you can get a light mist or a powerful one. If we ever need another in the future we will definitely buy another. I would recommend this product to everyone.It is totally silent and does not make a mess with moisture.I had really dry heat and I would wake up with nose bleeds.Have not had one since using this in the bedroom at night.Very easy to refill and not heavy. This product was easier to use than I anticipated. Easy to fill and clean. I love the adjustable control. I start it on high a few minutes before bedtime and then turn it to a lower setting at bedtime. We wake up breathing easier and less congestion. Highly recommend! It doesn't get 5 stars, because I think the tank could be larger. I have mine on the highest setting because the air is really dry, and it goes through the water in less than 8 hours. It's fine on medium though. I really like that it's fairly quiet. It's no louder than a drippy faucet. I haven't cleaned mine yet, but it looks simple to do using vinegar. I've been using filtered water, so I don't get white flakes in my room from the minerals in tap water. Oh, and it gets the job done. My sinuses were really hurting from the dry air, and now with the humidifier I'm feeling better. Switched from a ProCare Cool Mist Humidifier to this. I never had a problem with leakage like other reviewers, but I didn't want to spend the money replacing the filter so often. I also felt like it didn't humidify my room at all. I bought it online and had it shipped to the store. Great value and had no damages, everything included in the box as well. This puts out a good amount for my room. I constantly have fans running too. I clean it every week as the instructions suggest, and I use filtered water instead of the hard tap water. I have the setting between medium and high and it lasts a few hours. 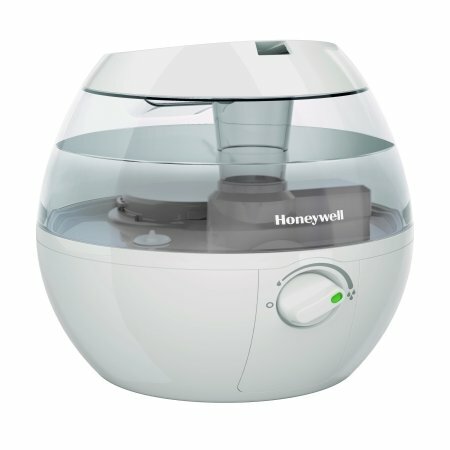 This humidifier helped my wife sleep and I'd recommend it to anyone. 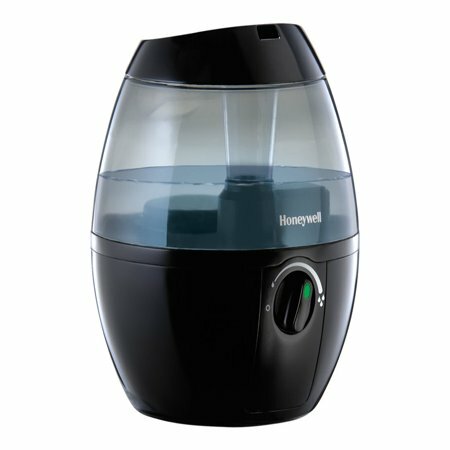 You can choose how much you want to humidify with the provided dial, which is neat. We only really used this in two rooms- both of which are giant, but it did a great job as long as you have it nearby. The only thing I'd mention is that the vapor builds up at the top where it exits the machine and beads of water end up rolling down the front. We set ours on a wash cloth and it doesn't really bother us, but I can see how this may be a turn off. Overall a great machine for the price. I got this one for myself, to put in my bedroom as i like it cool in there when i sleep. it is great for sound quality, no fan, that part is wonderful. the water dripping is to be expected and doesn't really bother me and if that is something that would keep someone awake or even wake them up they are a much lighter sleeper then me and i can not think of one that would work for them at all then, so for quietness i would rate this very well. the reason however I'm giving it four stars is because I'm having to run it on full capacity and I'm still having some dryness issues and by morning it is out of water and no longer running. so I do not get a full night of humidification, I'm sure if I were to turn it down some i would, however even at full run as i said I'm having dryness issues with my sinuses being still dry and getting bloody noses during the night. I purchased this one as I did not want a hot water one that would make my room warmer, and the older cold ones with wicks use fans that are so loud. overall, i am satisfied with this as it has made a difference, however it needs a larger tank. I am also only using distilled water in it as the reviews suggested because I do not have good water in any way and did not want to deal with any issues, and that has made it so there have been no problems with any film anywhere and clean up is really easy, all i have to do is wipe it with a cloth once a week so far and that is it, it is totally clean. so I'm taking one star away because even running at full capacity and only in my bedroom with the door shut, I'm still having some dryness issues and it doesn't last the full night on the tank it has.